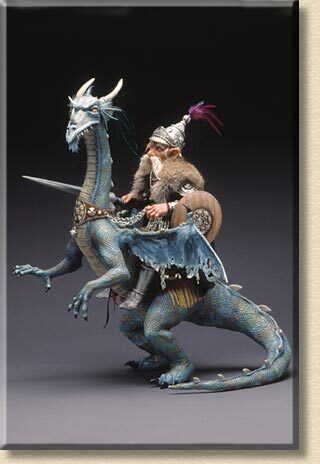 The warrior gnome is mounted on his giant steed: a great menacing blue dragon. Dragon: Dragon is sculpted of Paperclay over a wire and foil armature covered in glued strips of paper. His wings are silk, with burned edges, held out with wire covered with Paperclay. He is painted with acrylics and given a coat of varnish. He has a leather collar with a large brass medallion, to which his chain reins are attached. He has a fringed leather saddle, with a belt under the belly. Gnome: The gnome has head and hands of Super Sculpey, over a wire armature, with a cloth body. He has white mohair moustache and hair. The armour boots, breastplate, epaulets, and helmet are all sculpted from Super Sculpey and painted silver, then "aged" with brown paint. The gnome wears pants, a shirt with metal armbands, and a cloak with a fur collar. He holds a long spear made from a dowel with a Super Sculpey point. Awards: May 2000 - First Prize - Original Doll, Mixed Media and Best in Show at CDAA Conference.